The tugboat skippers in Townsend told us to stay well off the Oregon shoreline, at least seventy miles or more around the bar of the Columbia River and not to even think about closing the coast until we’d cleared Cape Mendocino, only then must we lay a southeasterly course for San Francisco. By then we’d be over hundred miles out offshore. The tugboat boys said the latitude of Cape Mendocino is notorious for bad storms, they told us we would need plenty of sea room to avoid the worst of the seas or if we needed to heave-too. We did all of that, we did just as everyone said but still we got hit bad, Dave saying we should be ok didn’t fill me with confidence one bit. Dave always says we’ll be ok and sometime we’re not ok at all. Like now. This is what happened. The weather forecast we got in Townsend showed we’d get winds with rough seas but there were no signs then of the really bad storm that bore down upon us right now. But there was a big storm a long way out in the Pacific, this one changed its course and suddenly travelled eastwards as a huge southwesterly gale. Leighton’s message on the satellite phone warned us of sixty to seventy knot winds so we got everything ready to be battered yet one more time, but this time we were just not on the ball at all. When the gale hit us we just went from one crisis to another, because we’d had three easy years in Alaska’s Inside Passage and now we were just ridiculously complacent. First off, a good sized wave swamped our stern sending our bucket and outboard fuel-tank under the steering wheel which then jammed, that then tripped our autopilot which meant we broached beam-on to the next big green wave that nearly capsized us. All because we’d forgotten to tie down the bucket. Then the same thing happened again five minutes later because once more we didn’t tie down the bucket. Then our rudder started to make horrendous crunching sounds just when we broached a third time. But this time we didn’t know why we broached except that Dave lost his temper and kicked the bucket. Then our brand new Raymarine plotter tripped out which once more disengaged our autopilot and by this time we were in big six-metre seas. It turned out that Dave had pressed the wrong button on the plotter. But the rudder was sounding bad, it seemed like the bearing was about to give out. Just past midnight things got even worse. The wind across our stern was now well over fifty knots gusting sixty and our dodgy rudder bearing, which we think was damaged when we broached, was struggling to hold the autopilot. We both went out to get all the sails down so that we could run under bare poles, then things seemed a little more controlled so I went below to make some nice hot tea because by now it was so cold in the horribly black night. Dave received another message from Leighton asking if we were ok, Dave replied that we might be in a spot of bother and I said to Dave that it was more than a spot of bother, if our rudder bearing gave way then we were in serious trouble. Around two in the morning Leighton contacted the US Coastguard to say that we were a British sailboat out in the big storm and we had problems. The coastguard came in over the radio asking if we needed assistance or evacuation, I told them we were ok for now but could they stand by. They diverted their coastguard cutter in our direction to stand a few miles off in case we needed rescue. They buzzed us with their helicopter just in case. But we were ok because by this time we’d got our act together and were working hard side by side to make sure we survived. We took turns to steer Sänna by hand in the by now horrible seas to make sure our autopilot didn’t trip again, one more broach in these conditions with breaking seas and we’d easily roll and capsize. In the morning things eased, I cooked up a good English breakfast to cheer us both and talked to the coastguard who’s ship we could see tracking us on the eastern sunrise horizon. They’d stayed with us all through the night. I called them offering grilled sausages which was a genuine offer to thank them for being there to make sure we were ok. When I described over the radio how we make a proper English breakfast I fancy they altered course in our direction. By afternoon the winds died back and so we laid our course for San Francisco. Two days later when approaching the Golden Gate Bridge under the power of our brand new Yanmar engine, the engine suddenly died. How’s that for a glorious approach to San Francisco? Wonderful Leighton and his good friend Skip sailed out to meet us with a tow line just in case…. but we made it under San Francisco’s Golden Gate Bridge when Dave got our engine restarted. 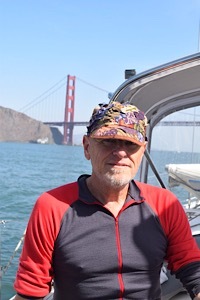 We anchored right off Sausalito and went up to Skip’s house there to drink good California wine. We drank lots of good red wine with the thick brown haze of the terrible Californian wild-fires stinging our eyes, then Leighton left because a telephone call warned that his house in Sonoma might burn down. Dave said we’d been lucky to get through but I said it wasn’t luck at all. We’d worked hard to survive whilst our good friend Leighton who’s own house was in real danger made sure we were safe, we had the marvellous American coastguard’s cutter by our side and genuinely concerned friends ashore to help us if things turned up bad. I am SOOO proud of you two!